Stylish storage is so in these days, and so is the Oxford Distressed Brown Three Door Credenza! 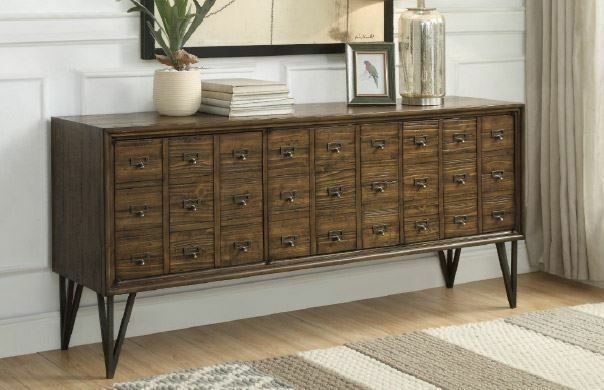 This trendy credenza is perfect for adding some extra storage to your home while also adding style. Featuring a vintage card catalog design, two adjustable shelves, and adjustable levelers, this cabinet is ready to store all your precious valuables. Add even more style by placing your favorite family picture or most prized knick-knack atop this trendy piece. Take home the Oxford Distressed Brown Three Door Credenza today! Stylish storage is so in these days, and so is the Oxford Distressed Brown Three Door Credenza!